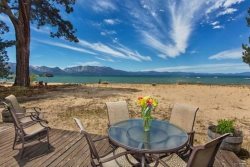 Right across the street from the lake in highly requested Al Tahoe neighborhood. Spacious cabin with a nice big living room for a family or friend gathering. Only 2 miles from the casinos and Heavenly Mountain Resort. Sleeps 7, fully equipped kitchen, linens provided, washer/dryer, cable TV, DVD, wireless internet, great big river rock fireplace. No pets and no smoking. Driveway is single lane. Stairs are fairly steep - caution for the kids and elderly. City of South Lake Tahoe VHR permit #: 4257Note: There is a separate studio unit behind the cabin which may be rented to long term tenants. Note: There is a separate studio unit behind the cabin which may be rented to long term tenants.